One of the plants given to me in a bucket from my partner’s parents was an iris. I’ve had it for a year or two now and recently discovered it was an Iris Sibirica (Siberian Iris). I’m not sure what variety we have (Emperor? Royal Blue? ), but it is a stunningly beautiful and unusual flower. The form is so elegant and the pattern is striking with the rich cobalt blue colouring and the scent is out of this world. We only had one flower last year but as the iris clump establishes and grows, we managed many more flowers this year. They look so delicate and fragile, held atop slender but sturdy stems and look particularly nice against the light green foliage and white flowers of the Choisya that shelters it. I’m not a fan of the dwarf or small irises (Iris Reticulata) and I don’t like the large-leaved, fat rhizomed, bearded irises that have fussy and frilly flowers (they look over-bred). The Siberian iris, with it’s plain narrow strap leaves, strong stems and exquisite scented flowers is the definition of the perfect iris for me. 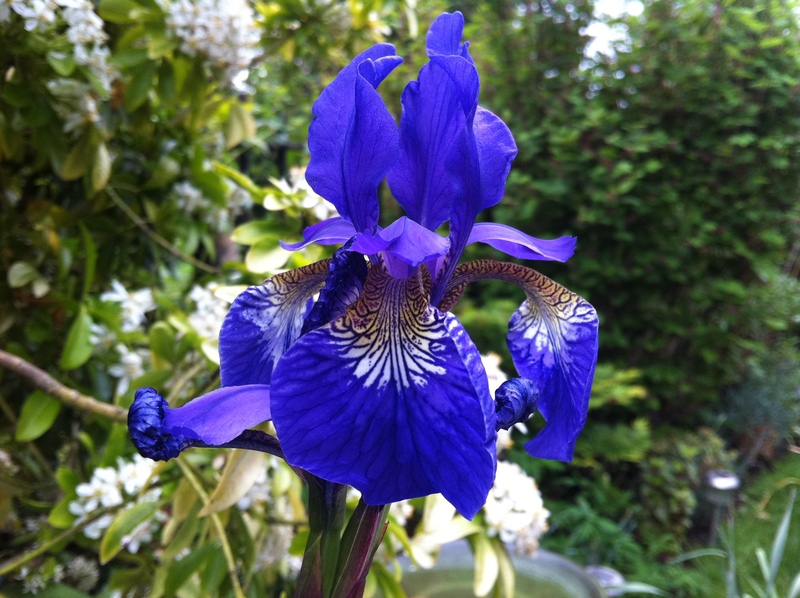 This is a gorgeous Siberian iris; what an amazing shade of blue! I haven’t seen any before that are this intensely blue; all the blue ones I grow are more of a blue-violet. Thanks! I was also really struck the first time I saw this iris flower. It was given to me in a bucket and was the first iris I planted. I’ve recently obtained a few more and am trying to propagate this one from seed although none have germinated yet – perhaps division is a better way to go! Wish I could tell you the variety of his one but I’ve no idea.